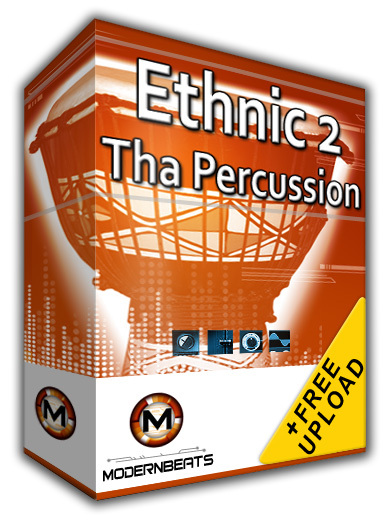 Download Ethnic 2 "Tha Percussion" - Create your own Ethnic percussion rhythms for today's R&B Hip-Hop music! This multi-format collection contains over 500 ethnic percussion samples (160MB) from 21 high-quality ethnic percussion instruments ranging from the Talking Drum to the Djembe to the Cajon! The library features accurately recorded percussion samples capturing all nuances of sound along with core samples. Each instrument is multi-sampled by an average of 25 samples per preset. All percussion samples are laid out across the keyboard according to specific timbres where users can easily create realistic percussion performances by simply playing samples in a chromatic order. With the 21 multi-format presets included in this Ethnic Percussion Collection, creating powerful realistic ethnic hiphop beats has never been easier! Each instrument can be loaded into all major software samplers out of the 6 major software sampler formats provided. Get current. Get ethnic. Get Ethnic HipHop Percussion! Ethnic Soundset Formats - ModernBeats Ethnic soundset formats include 7 formats total for auto-loading into your software sampler of choice: Reason NN-XT (.SXT), EXS24 (.EXS), Kontakt (.NKI), Battery (.KIT), Halion (.FXP), Soundfont (.SF2), and WAV (.WAV). Compatible with FL Studio, Fruity Loops, Acid Pro, Logic Pro, Cubase, Reason, & Pro Tools.